Daily cleaning is the best method for you and the cat. A dirty litter box is an unpleasant element among your home decor. If you employ the best cleaning methods, though, you and your cat will enjoy a fresher, less odorous box. The cleaner the box the more unobtrusive its presence in your home, so don't be shy with that scoop. Unquestionably, the best way to clean a cat litter box is to scoop it often. Once a day is great, but twice a day is even better. Not only does this cut back on the odor that you and kitty both have to endure, but it makes the experience more pleasant for your pet -- after all, he's walking around in there barefoot. It also reduces the chance of parasites affecting you, your partner or the cat. If you use a clumping litter, your twice-daily scooping eliminates both solid waste and urine, making the litter last longer. If you don't use a clumping litter, your best strategy will be dumping and scrubbing regularly. Once a month, dump everything out and give the inside of the box a gentle scrub with hot water and mild dish detergent. After it's completely dried out, refill it with 2 to 4 inches of fresh litter. If you use a non-clumping cat litter, you can't scoop out pee in blocks of litter like you can with clumping litter, so you have to dump and scrub significantly more often. Once a week is the bare minimum to get rid of the urine that accumulates every day -- twice or three times a week is even better. Clumping litter lasts much longer if you scoop solid and liquid waste daily, but go ahead and dump it rather than top it off, because bacteria and miniscule bits of waste linger regardless of your scooping diligence. Two ways of controlling cat litter odor exist; which one is best for your home depends on your cat. Not all cats appreciate aromatic and odor-control cat litters. If your cat won't use scented or odor-control litters -- and it won't take long to figure out if he will or won't -- switch to unscented. The Humane Society of the United States recommends maintaining a fresh, clean scent by spreading a thin layer of baking soda in the box before you fill it up with fresh litter. This absorbs odors without any artificial scents or off-putting chemicals. Take no shortcuts. The best way to clean the litterbox is to scoop daily,. Don't cheat. Dumping extra litter in the box doesn't mean you can wait longer between cleanings. Some cats will actually reject a box that's too full, so stick with 2 to 4 inches. 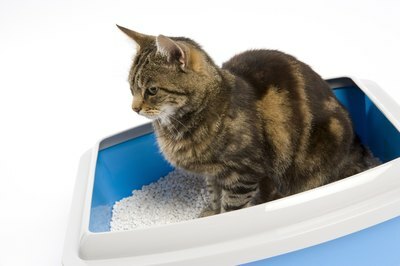 Plastic liners that go in the bottom of the litter box may seem smart, but often they prove of more aggravation than ease. Cats tend to rip them with their claws while digging around in there. The daily scooping and the monthly dump-and-scrub combined are your best means of effectively cleaning your cat's box. Does Cat Litter Deodorizer Work? How Often Should You Replace a Cat Litter Box? When Can a Cat That Got Declawed Use Kitty Litter?